Crystal's Crazy Combos: Earth Day Zoya Nail Polish Exchange! Hooray for Earth Day! Once again, Zoya is helping you do a little spring cleaning with the return of the Earth Day Zoya Nail Polish Exchange* for 2013. Clean out your nail polish wardrobe and get rid of old nail polish that may not beBIG5FREE (Free of Formaldehyde, Formaldehyde Resin, Toluene, DBP and Camphor) and exchange it for a greener alternative - long lasting, award winning, healthy Zoya Nail Polish bottles! 1.Ship back the equivalent number of bottles you received to the return address below (ie. If you ordered 6 bottles of Zoya – you would send us 6 NON-ZOYA polishes). Please check with your carrier on the proper way to ship nail polish. 2.Include a copy of your order. The bottles you send in cannot be Zoya, Qtica or Nocti polishes (but they can be any other brand). We are using the honor code here folks! 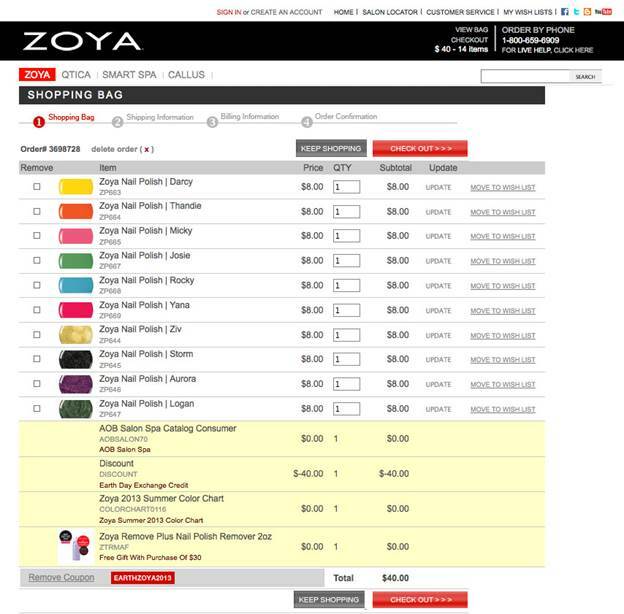 We want to make sure you get your Zoya Nail Polish! We send you the polish first then you send your old polish back to us! If you do choose to send us your old polish we promise to properly dispose of it according to EPA guidelines. This offer is only good for 1 week so hurry –Don’t Wait!